Provide comfort for the family of Kaitlyn O'Reilly with a meaningful gesture of sympathy. 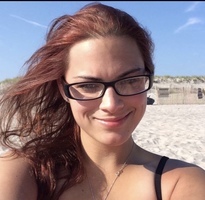 Kaitlyn Marie Panarello O’Reilly, 26, a lifelong area resident, entered into eternal peace on March 13, 2019. Born in Sharon, CT on October 4, 1992, she was the daughter of Christopher and Terri (Wisseman) Panarello. Kaitlyn had worked as a waitress at the Daily Planet in LaGrangeville. She enjoyed playing softball, going to the beach and country concerts, and shopping. More than anything, she loved life! She will forever be remembered as a loving mother, wife, daughter, sister, granddaughter, niece, cousin and friend. Kaitlyn loved dogs, especially her dog, Karma. On March 31, 2017, Kaitlyn married Patrick James O’Reilly Jr. In addition to her husband and parents, Kaitlyn is also survived by her beautiful, two-year-old daughter Lilliana; her brother, Christopher Panarello; her grandmother, Deanna Panarello; her mother-in-law, Linda Hornbeck; her father-in-law, Patrick J. O’Reilly Sr.; her sister-in-law, Megan O’Reilly; her grandmother-in-law, Kathleen O’Reilly; and many aunts, uncles and cousins. Calling hours will be held on Sunday from 2-6pm at the McHoul Funeral Home, Inc., 895 Route 82, Hopewell Junction. The Mass of Christian Burial will be offered on Monday at 10am at St. Denis Church, 602 Beekman Road, Hopewell Junction followed by interment in St. Denis Cemetery. Memorial donations may be made to Kaitlyn’s daughter, Lilliana O’Reilly and mailed c/o McHoul Funeral Home, Inc., PO Box A, Hopewell Junction, NY 12533. Please visit Kaitlyn’s Book of Memories at www.mchoulfuneralhome.com. Consider providing a gift of comfort for the family of Kaitlyn O'Reilly by sending flowers. We encourage you to share your most beloved memories of Kaitlyn here, so that the family and other loved ones can always see it. You can upload cherished photographs, or share your favorite stories, and can even comment on those shared by others.